Silverton 35 Motor yacht: Here's where to put everything. The 35 Motor Yacht makes a good case for stepping up from an express cruiser. Anyone who has ever owned a boat knows that space is a number one priority — space not only to live in and move around, but also to store the things you'll need while aboard. Silverton's new 35 Motor Yacht is an answer to the need for space. What's more, it's done with style. The combination of space and style aboard the Silverton 35 Motor Yacht addresses another boating issue. Once you get out of the runabout category, you're probably going to spend as much time, perhaps more, away from the helm. This type of boat is made to be lived in, not just taken for a ride. The Silverton 35 has a roomy saloon, a full galley and two staterooms — each with its own complete head, and each with a separate shower stall. Topside, a spacious cockpit opens to a convenient aft deck. The 35 Motor Yacht makes a good case for stepping up from an express cruiser. The saloon is surrounded in glass, to bathe the interior with light. A rich selection of fabrics, upholstery, carpeting and cherry wood cabinetry makes the space warm and comfortable — and not the least bit confining. The interior is full width, to take maximum advantage of the hull's beam. It is divided into three areas. The first two are for seating, and are on the same level. Aft, there's a settee to starboard that converts to a double berth. It is opposite an entertainment center, to port. Standard equipment here is a Sony AM/FM stereo with XM Satellite Radio capability and a single CD player. 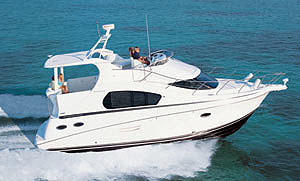 An optional 20-inch television, a VCR and a satellite television system are available. 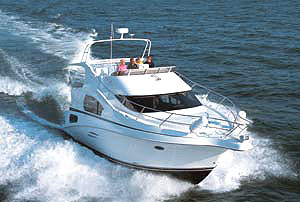 The boat is prewired for TV antenna connections in all three cabins and includes a Glomex marine TV antenna. Immediately forward on the port side is the dining area — a U-shaped lounge set around a pedestal table. One nice feature of the layout is that people on the settee and those at the table are facing each other — and are close enough to converse easily. The open galley area is opposite the dining table — one step down from the main saloon. It is accented by two expansive Corian countertops. The galley's standard equipment includes a full-size refrigerator/freezer, a two-burner electric stove, a microwave oven, a coffee-maker and a deep stainless steel sink with a removable faucet sprayer. If you accidentally spill something, the galley's real hardwood flooring makes for easy cleanups. When it comes to sleeping accommodations, the Silverton 35 Motor Yacht has two staterooms that are nearly equal in size and features. The master stateroom is aft and has a queen-size berth with an innerspring mattress. It is built on a pedestal that is completely accessible for storage — and it includes two pairs of drawers. 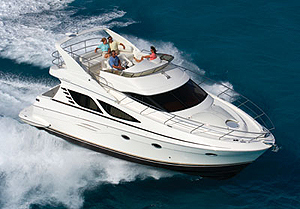 You'll find a floor-to-ceiling hanging locker, to starboard; and a half-size locker to port. Space is generous in the head, too — both for storage and moving around. There's an attractive vanity with a Corian countertop, plus a standard electric head and a separate shower stall. The forward stateroom's berth is set at an angle, instead of being squeezed into the hull's "V." Its mattress is also of innerspring construction and is placed on a pedestal storage compartment. The forward head is split. The toilet and vanity are to port — and the shower stall, with its bench seat, is to starboard. 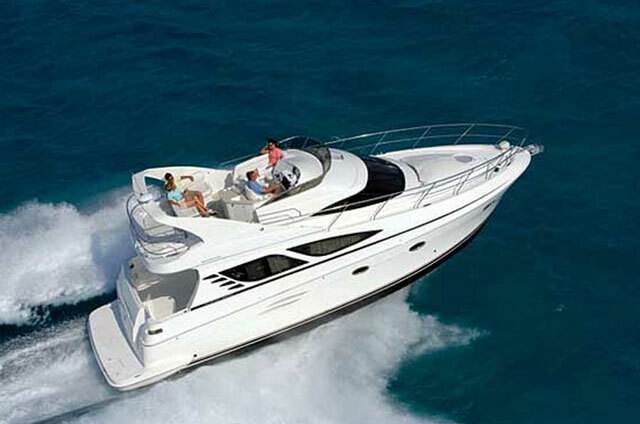 One of the best features of the Silverton 35 Motor Yacht is that you have choices of where to spend your time aboard. The cockpit and aft deck accoutrements are just as comfortable and spacious as the belowdecks accommodations. The aft area is an open expanse made for a table and chairs. A bench seat along the stern is cantilevered over the swim platform, to maximize the deck space. It offers a wet bar with space for an optional ice-maker. A standard hardtop keeps the aft deck protected from the sun. For further protection from the elements, optional side curtains with screening can enclose this area. The flybridge is open to the aft deck, to keep you and your guests in the same conversation loop. The seating "up top" includes a bench along the aft section and a doublewide seat at the helm. The steering wheel is located on the boat's centerline — and the captain's position has a fold-up bolster for standing operation, if desired. While doing so, visibility to all quarters is excellent. Bring on the 10-inch electronics displays, because there's plenty of room to mount one on each side of the engine instrumentation. Another Sony radio/CD stereo, identical to the one in the saloon is standard here. So are bilge and fume alarms. 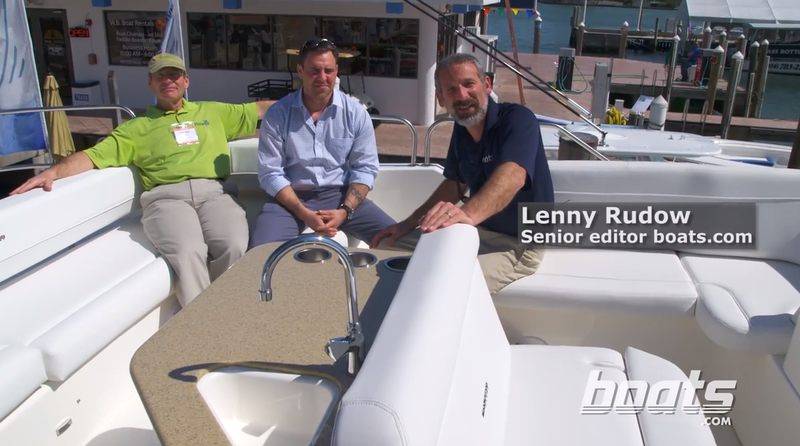 A remote-controlled windlass and spotlight, plus a bow thruster, are a few of the available helm options — in addition to electronic engine controls and navigation gear. The day we tested the Silverton 35 Motor Yacht was not pretty. Mother Ocean wasn't going to give us a smooth ride — but this boat was up to the challenge. It took a combination of confused seas and stiff gusts in stride. Windage was not a factor in handling. The 35's low center of gravity countered the effects of its high, flat sides. That, coupled with the hull form, produced a soft ride, too. The high flybridge — with an optional full enclosure — kept us dry from what little spray made it up there. 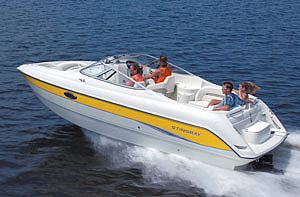 Our test boat's twin Crusader 8.1 liter gasoline engines moved the boat through the chop with authority. The boat came on plane quickly, with a slight bow rise. Midrange acceleration was strong and turning stability was tight. During our test, we hit a top speed of 27 knots. Cruising speed was at 18 knots, at 3,400 rpm — and at that point, the fuel consumption was 22.3 gallons per hour, per engine. This stout little boat took on everything that came its way — and did it with style. 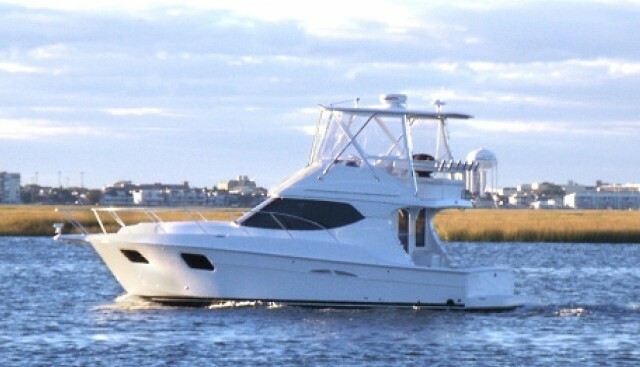 AM/FM/CD stereo at saloon and flybridge; dual-voltage refrigerator/freezer; innerspring mattresses in both staterooms; Corian countertops; Glomex TV/FM antenna system; dripless shaft seals. 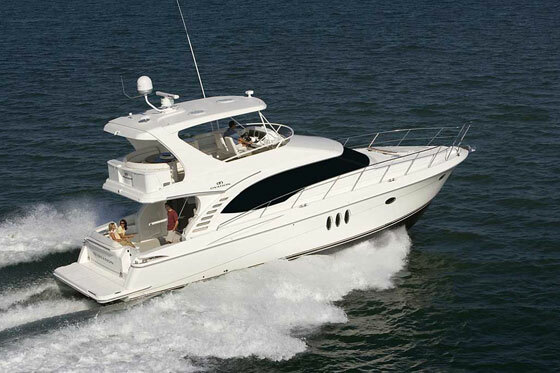 Three-zone air conditioning; Ultraleather seating; auxiliary generator; electronic engine controls; VacuFlush heads; electronics arch; full flybridge and aft deck enclosure. Fiberglass bottom utilizes four layers of 2415 stitchmat; 3 mm Coremat; two layers of stitchmat used above the waterline. Gelcoat is 3-ounce skin.